Bill, do you have any knowledge....or guesses....regarding the meaning of the Lens number....RE2796? I'm wondering if that number can help identify the size/focal length of the lens. I'm extremely rural and localized. It is several days travel to a small grocery store and gas pump, and I don't think there is Google Translate here, mon ami. Google has probably not found it profitable enough to pipe all of their services this far into the hinterlands. Thanks for the link. I did, indeed, try to educate myself, but I got a Google warning that the site is phony, dangerous, and my financial information would be at risk. As a fearless man, I tried to circumvent the blockade, but to no avail. Do you think it's because of the distance and technological backwardness of Alaska? Or is it perhaps because the site is constructed by hooligans? Was it translated from French? Is 1997 when Randi polluted the internet? But, unfortunately, I don't have the right to tell you here how I really feel. Each Kodak lens has a specific seriel number stamped into it. I haven't yet found any code for how the numbers are generated during manufacture. All my Kodak Ektar lenses (I have 5) have a seriel number but I don't have the exact notes on the numbers at the moment. I do agree BD, getting a solid figure on her walking speed could go a long ways to swaying belief to real, at least for myself and I’d think maybe others. The film subject is a legitimate 7 footer just like me. We both walk around 3 mph. Man or beast. Both bulky and muscular. 348 pounds for me. Manufactured muscles in a gym with lots of food. The film subject appears appears heavier and more heavily muscled with calves of envy. P-G, you may have posted earlier about your walk. You are over 7', and what is the distance of your stride at 3mph? When you walk on sand/soft ground, how deep are your imprints? I just don't understand why the issues of the PGF are so hard when it comes to Patty walking. If a man can walk a Patty- distance/ rate in a certain time then it means Patty could be a man. If a man cannot, it means Patty cannot be a man in a suit. It would sure seem to me we have enough information already to put that to a test. Don't we really already know the speed limit where a man cannot really beat Patty in a foot race? Here is the big idea used at the NFL combined 40 yard dash. 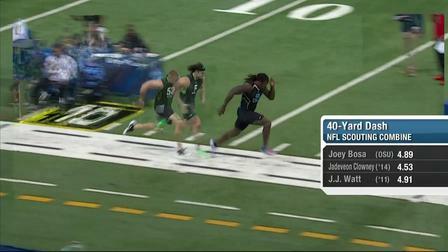 The top 3 linebackers last few years are compared running the 40 yard dash. This shows us in this overlay who is the fastest. If one contended JJWatt was the fastest linebacker, we would not need to see his 40 time to know he was the 3rd fastest. We could prove he could not beat Clowney's 4.53 time from 2014 in a race even if we did not know the stop watch time. All we need to know is who is winning the race when compared to the other. Can't this be applied to Patty vs a test subject or Patty vs Jim McClarin tested at all the known/ possible camera speed settings? Not nearly as deep as the Patterson film subject. To my knowledge only one investigator, the late René Dahinden, tried to retrieve the rental camera that Roger Patterson used. I think it was used for work at Del Monte (fruit company) but I think he came up empty handed. I think at a certain point along the investigative road the light bulb goes on and you realize you have a case (the P-G film) of immense importance and you want to preserve as much as possible associated with the film, and along those lines, René, almost single handedly, did most to preserve data associated with the historic 1967 film. In the late 1990s I bought a Kodak K-100 movie camera with a turret front (three filming lenses/three viewing lenses) and I showed it to René at the gun club. He was beyond fascinated! He kept looking at the 25 mm lens and how much real estate you could see from edge to edge. In fact, I think he looked at it, put his eye to the camera, set it down, smoked his pipe, didn't say much, and then started looking at it again. It may have been the first time he had that specific camera in his hands. Great memories. He was a friend and a colleague. Just so sad that the new generation of Bigfooters have never met René. Q: Other than determining Patty's Height, why is the camera lens an important issue? The lens is only important for calculating Patty's height by the lens formula. It has no other importance, except a possible photogrammetry reconstruction of the filming location. For that, we also need to know the lens focal length. I was re-reading a part of When Roger Met Patty about the filming event. It is great play by play for those who have not read it. In WRMP it is clear early on Roger has a couple of times his finger (while running ) causes a couple starts and stops for just a second or so. I want to say, I think this is interesting and would be unrehearsed. However, I don't know if that interesting finding has meaning on proving a legitimate filming event. If a man was running to film Patty walking away frantically trying to get her on film a finger slip or two might very well be expected and that is exactly what we have. It is something hard to see and something not easily detected or understood by those back in 1967 era viewing of the film. It supports/ doesn't hurt a real filming event. I would say if a man was going to fake a film this same thing might also happen. There might not be any real intent to make it happen as a hoax but if you are running anyway wouldn't a finger slip for a second or two happen anyway. It might just be the guy runs over in the act of filming the man in a suit and accidently (since he is running with a camera with film in it) hits the button a couple times. The same might be said about the twisting aspect of the early images. If a man was running after a real creature we would expect to see the starts and stops and the Twisting or rotation of the images we happen to see. I wonder though if we would seem the same (or near same) if a man was just running after a suited man. Arms are swinging either way if you are running to fake the filming. I have to think the rate of the camera man's run toward Patty and the extreme of the twisting of the image would be greater in a real event (something frantic) than in a pretend run of a pretend excitement. The start/stop of the trigger on the K100 I would think could happen under either scenario. -observe twisting on the images on the film but probably less intense. -running rate is fast toward Patty but probably a slower speed toward Patty. I would think the diff maker here is in a real scenario the run, the twist, and very extreme. Less likely in a fake event. Either way the finger trigger thing might be the same. What do I think? I think that you are over thinking this. The K-100 series was designed and built to film football games. It is not a 'run and gun' camera. The viewfinder diameter is just under 9/16" diameter. Try running over terrain while looking through a tiny hole and the path is not a straight line. It helps to understand a camera operator's behaviors. In a planned and deliberate filming situation (such as a filmed performance, or a hoax), the camera operator never puts his/her finger on the camera trigger (start/stop device) unless the operator is intending to film. Once doing that, the operator holds that steady for the duration of the intended shot. If moving on uneven or irregular ground, the camera operator puts the camera on with a control that doesn't need a constant hold to continue. And the K-100 has such a control. The trigger lever has four positions. "OFF" is the default position. "One UP" with take one frame of film only, for stop-motion filming effects. "One-Down" will run the camera continuously, as long as the operator holds the lever in that position, and a spring will push the lever to "OFF" if the finger releases hold on the lever. "TWO-DOWN" position locks the camera on, and the operator can release the finger hold, and the camera will continue to run, until a finger deliberately pushes the lever up to "off". So an operator filming deliberately and wanting to insure the camera runs without interruption simply pulls the lever two steps down to locked "ON", and can let go, until desiring to stop the filming. If Roger was faking the film, that's what he would have done, given his actor a signal to start walking, and he's switch on the camera locked in "on" position, and chased his actor until he ran out of film. Then he could shake the camera all he wanted, let it fly around as he ran over the uneven terrain, and get the appearance of a wild chase. But the camera wouldn't have started and stopped six times in the filming. An operator filming in an unplanned situation, where there's no control of the filmed subject, will keep his/her finger on the trigger lever and only pull down to the first "on" position, so he can release it and stop the camera as soon as he's aware the shot may not be useful footage, to save film. And he may accidentally release the lever unintentionally, and then re-start as soon as he realizes what happened. A operator filming deliberately, would never stop and re-start because that would signify he was an amateur, and might likely get him fired from the job when the producer reviews footage in the screening room.